Acoustilay 15 is suitable for anyone looking to minimise both impact and airborne noise. Years of research and development went into trying to create a product that could maintain all the acoustic properties of the finest acoustic boards, whilst remaining 100 per cent recyclable. The Acoustilay range is exactly that. Sustainability has long been an issue for specifiers seeking to find new products for their projects, and the Acoustilay range delivers. Constructed using a resilient foam core bonded between two attenuating surfaces, it is the perfect insulating material. The PVC free material is made using a polymer known for its lack of toxicity. 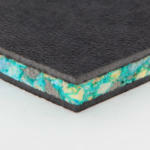 The barrier mat material – which provides the mass – is manufactured from pre, mixed and post-industrial waste sources. Acoustilay 15 measures 15mm thick and is supplied in 1200mm x 1200mm pieces. It can be loose laid or bonded to the floor or fitted tight up to the perimeters without the need for an isolating strip. Acoustilay will not transmit vibrations into the walls. Sheets should be laid in a brick pattern, with staggered joints, and butted tight together. One of the most renowned acoustic underlay products in the world, Acoustilay continues to be popular with huge numbers of people. The Acoustilay range is manufactured completely in the UK, meaning that the carbon footprint traditionally associated with imported goods is substantially lower even before the material itself is taken into consideration. The Acoustilay range is consistently popular with specifiers and end users due to both the high acoustic performance it offers and the unparalleled ease of installation. Acoustilay 15 is installed as easily as conventional carpet underlay but with the added benefit of superior noise insulation. It does not limit access: it is simply laid under most floor finishes and replaces existing underlay. Acoustilay 15 can help to meet Part E of the Building Regulations. Acoustilay is also popular amongst private owners looking to upgrade the sound insulation of floors in their own properties.